First chartered in Seneca County, one of the longest charted Posts in 7th District. SENECA FALLS WELCOMES Its Soldiers, Sailors and Marines Home, July 11, 1919, Large Celebration Planned, Parade On Fall Street, The soldiers, sailors and marines gathered for a monster parade and gala day during which they received the formal welcome home of this community. The various committees in charge of the celebration made diligent efforts to have every World War veteran present at the time and they were urged to don their uniforms. A special committee..
Should Organize Post, The returned servicemen of Seneca Falls should take the lead in organizing a post of the American Legion organization. Auburn men have done so, in a tribute to W. Mynderse Rice, who has made the supreme sacrifice. The need for such an organization becomes apparent each day. There are endless opportunities for the servicemen, once they are organized, to aid in perpetuating the ideals for which they fought. 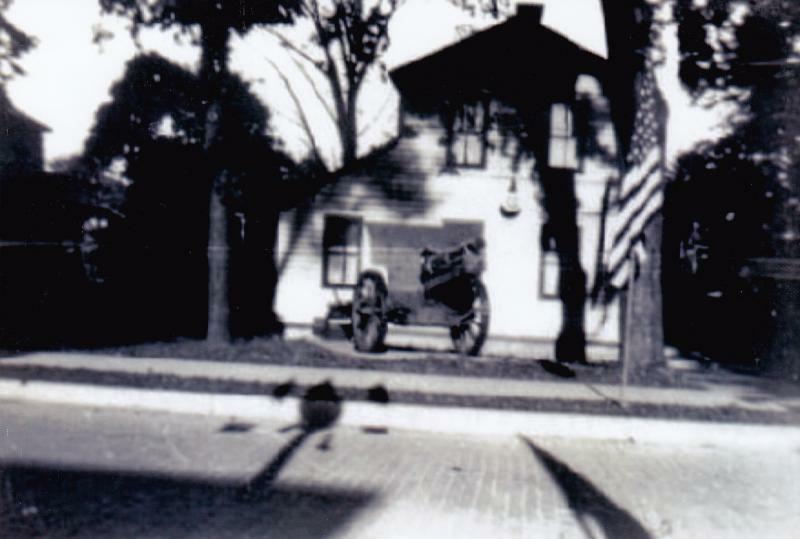 FORMATION ANNOUNCED, Formation of the first Post of the American Legion in Seneca Falls was announced by Wade H. Hays, State Secretary of the American Legion, 140 Nassau Street, New York City, New York. The new Post will be known as the "Seneca Post" of the American Legion. John J. Hanlin, 99 East Bayard Street is the organizer of the Post to whom applications should be sent. In addition to Seneca Falls, it is expected..
New York State Post, No. 366 Charter Issued, The Post receives its Temporary Charter, from the Department of New York, and starts the formal proceedings for organization. Applications are still being accepted. More information to follow about meetings in the next few days. Vets Meet Tonight, In Elk's Temple tonight at 8 o'clock there will be a meeting of servicemen who are eligible for membership in the American Legion, and Seneca Post will be formally organized by the election of officers. A large meeting will be necessary to represent the several hundred young men of Seneca Falls, and it environs who were in the armed service of the country during the Great War The young men who have.. In the Elk's Temple last Friday night the World War Veterans of Seneca Falls and vicinity held their first regular meeting as a local branch of the American Legion and they perfected the formal organization of the Post. George Gargan heads the organization as president. The name that was unanimously chose was "Kirk-Casey Post." Frederick Kirk and Maynard Casey were killed in action while fighting with the 77th Division and their sacrifice supreme will be.. NOTE; The two young men that this Post was named for, were among the last forty-one group of drafted men to leave Seneca County on February 26, 1918. They took their training at Camp Upton, Long Island, and were sent overseas to France. After being killed in action, they were interned there, and their bodies returned to Seneca Falls for burial in June, 1921. Their sisters, Cecil Kirk and Elizabeth Casey would be Charter Members..
Kirk-Casey Post No. 366 now has a women member duly enrolled. Miss Sara Martin, who served over a year as a nurse in France, and who is now engaged in that profession in Auburn , has enrolled in the Post. Miss Martin received her training in Willard State hospital and was a resident of Seneca Falls for a time before going into the service. She saw the most difficult kind of trying service in an..
Seneca County men who are veterans of the World War, are rapidly getting the affairs of the American Legion well organized. The first county meeting was held in this village last Saturday and delegates were chosen to the first state convention to be held in Rochester on October 10th and 11th. Delegates from Kirk-Casey Post, No. 366 are: George Gargan, Clarence Kissel; Seneca County Delegates at Large: Andrew T. McArdle,S.S. Gould, Jr.
professional boxing matches will be the principal item on the program. No Celebration Armistice Day, November 11th, Officers of Kirk-Casey Post had plans well under way for a celebration of Armistice Day, but the voting on the soldier bonus question throughout the county so displeased many of the service men that the Legion officials have given up the celebration project entirely. The village board was asked Monday night to declare a half holiday for next Thursday, and the request was promptly granted, but all of the..
Elected, at a meeting of the members of Kirk-Casey Post No. 366 in the Elk's Temple last night, a special election was held, and Thomas J. Riley was elected to fill the vacancy created by the resignation of George Gargan as President. The plan for Mr. Riley, was he would take the oath of office at the meeting which was held on November 7th. He had requested a few days to get his affairs in.. The Memorial Tablet, that has been procured by the Sa-go-ye-Wat ha, Chapter of the Daughters of the American Revolution, and upon which appear the names of all of the Seneca Falls, servicemen who had a part in the World War, will be formally dedicated next Tuesday evening at 7 p.m.. The exercise will be held in Trinity Church parish house and the officers of the D. A. R. Chapter invite all the relatives and friends..
An Auxiliary of Kirk-Casey Post, No. 366 was organized by women related to ex-servicemen at the dinner and dance given by the Legion men Thursday night of last week. The Charter Members are; Mrs. F. W. Lester; Mrs. A. R. Kenyon; Mrs. D. P. Loomis; Mrs. Robert Knight; Mrs. Fred Rockwell; Mrs. T. J. Riley; Miss Anna K. Mc Ardle; Miss Alice Henry; Mrs. Nathan H. Delevan; Mrs. Charles R. Botsford; Mrs. W. P. Ryan;.. 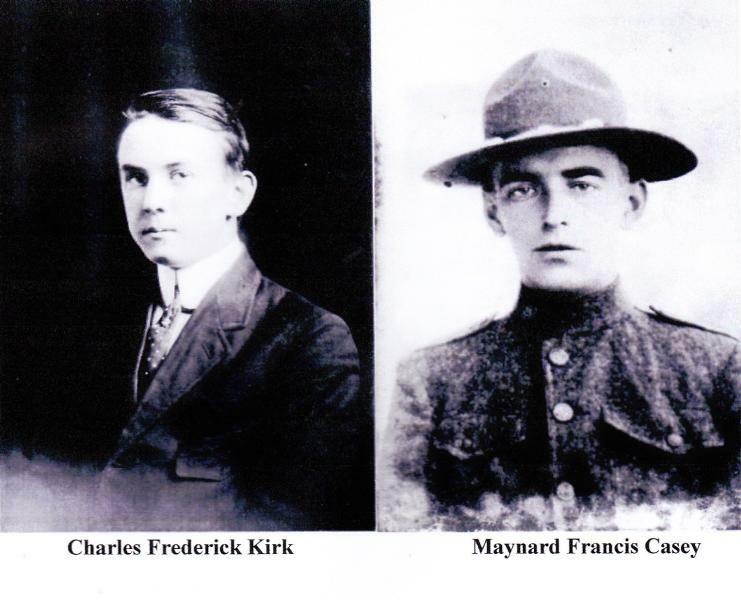 The bodies of Charles Frederick Kirk and Maynard Francis Casey, the two service men for whom Kirk-Casey Post was named, are expected to arrive in Hoboken about next Thursday and will probably be received here four days later. Officers of Kirk-Casey Post have made tentative plans for military funeral honors. Seneca Falls to Honor Memory of First Two Sons to Fall in Battle W.M. Follette, President of Village, Calls Upon Citizens to Cease Work During.. The wives, sisters and daughters of the men of Kirk-Casey Post, No. 366 of the American Legion have applied to the national organization for the issue of a permanent charter to form a unit of the American Legion Auxiliary at the local Post level. The organization name will be; Kirk-Casey Auxiliary Unit No. 366. The women expect the charter with-in a couple of months. The Unit would receive its permanent charter on May 23, 1923..
Will Convert Casey Home Into Club Rooms Plan to Build Large Hall. Kirk-Casey Post, No. 366, American Legion, Has arranged to buy the Casey property at No. 48 State street and will erect on the property a building that will provide a meeting hall for the organization with club rooms in the front. Building plans are not definite as yet but present intentions are to make changes in the dwelling to suit it for use..